Products, orders and contacts can be imported into Brightpearl using Microsoft Excel (.xls) files. 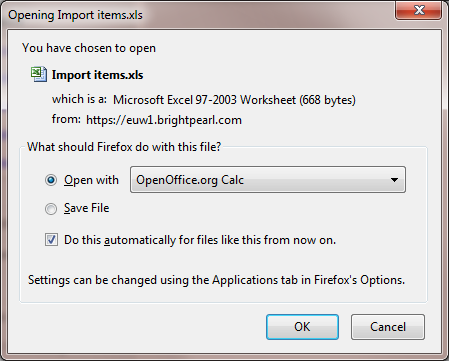 If you don't have access to Excel there are other ways to create compatible import files, such as using OpenOffice. Visit this website to download the latest version of OpenOffice: www.openoffice.org/download. After you've downloaded the file, install it on your computer. Add a data map in Brightpearl at Settings > Data/import. Click Export sample to download the data map as an Excel file. When the download window is displayed, select to open the file with OpenOffice and click OK. The file should now import successfully. If you are still seeing an error, try entering your data into this Excel Document instead.